Can Nvidia's Tegra 4i power the mainstream? Just ahead of MWC 2013. 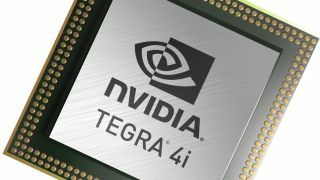 Nvidia has announced a new mobile processor called Tegra 4i. Aimed at the mainstream smartphone market, Nvidia believes the new chip will fill a gap in the company's offering. While Tegra 4's staple is higher end Android tablets, Tegra 4i (codenamed Grey, after Marvel's Jean Grey) is a processor very much designed for phones. That's because it's at the lower end, performance-wise – and so cheaper - yet is still designed to support 1080p Full HD and 4G LTE capable handsets; a specially optimised version of the Nvidia i500 LTE modem is included in the design. Like Tegra 3, it's based on ARM's older Cortex-A9 architecture (R4 A9) rather than the newer Cortex-A15 instruction set used for Tegra 4. So you get 60 Nvidia GPU cores as opposed to Tegra 4's 72, but the same 4+1 core design as Tegra 3 and Tegra 4 is used, clocked at 2.3GHz - the fifth core is a battery saver core. Nvidia is also shouting about the physical size of Tegra 4i's cores, saying that they are half the area (1.15mm2 vs 2.6mm2) of the competing Krait core from Qualcomm's Snapdragon S800 launched last month. It also claims that 4i beats even Tegra 4 in terms of performance per mm2. Like Tegra 4, 4i also features Nvidia's Computational Photography Architecture, enabling advanced imaging features such as tap-to-track and HDR panoramics. Nvidia has also announced a phone reference platform to showcase the design. Called Phoenix, it's 8mm thick, with 4G and a five-inch Full HD display. As always with reference designs, Phoenix is designed to be a blueprint that phone makers can work with when designing and building Tegra 4i smartphones to help get them to market quicker. Hopefully we'll see some handsets featuring Tegra 4i at MWC 2013 next week.